For women in the nineteenth century, the roles of women were tightly constrained. For most women, their future consisted of marrying and carrying on as a mother and homemaker. Any other career or activity not compatible with those roles was much more difficult. When the Civil War broke out, enlistment of women was prohibited. Some served in a civilian capacity as laundresses or cooks but more than 250 are documented as enlisting in the army as soldiers. The only way they could enlist was to disguise their gender successfully enough to masquerade as a man. This artfully made documentary tells the story of Emma Edmonds, a young lady from Canada who chose an alternative to her closely constrained future in a small village in New Brunswick. She fled her village and masqueraded as a man, thus gaining the career and freedoms of a man. When the Civil War started, she continued hiding her gender and enlisted in the Union Army as a man and successfully served for some time. The story involves a combination of modern images of Emma's home village, modern interviews, and re-creation of period events. 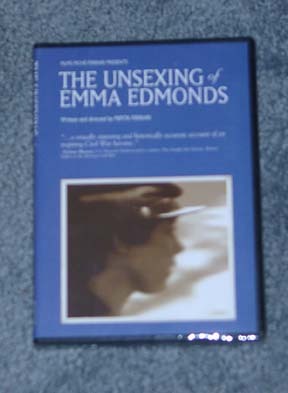 In telling its story, the film examines the roles of women in mid-nineteenth century life as well as the efforts of some of them to become directly involved in the war effort, using the experiences of Emma Edmonds as an example. The movie is written and directed by Pepita Ferrari, an award-winning maker of documentaries in Canada. Run time is 60:24 and there are more than 50 minutes of additional material.